Exterior steel activity and outdoor adventure trail equipment design and installation. A range of commercial grade steel outdoor fixed adventure trail equipment for schools, parks and public park use. Adventure activity and playground areas can be custom designed to bespoke specifications. Additional rope and climbing features, steel chain walking gangways, poles and slides are available as options. 25 year UK guarantee against steel corrosion. Outdoor adventure trail equipment suited our play park much better, turning our recreation area into a challenging environment..
Playground adventure trail steel fixed clamber bars. 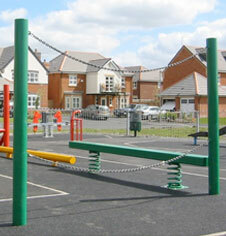 Playground adventure trail steel fixed jumping bars. Playground adventure trail steel fixed climbing rings. Playground adventure trail steel fixed climbing walls. Outdoor adventure trail steel fixed balance beam. Outdoor adventure trail curved balance beam. Outdoor adventure trail incline balance beam. Outdoor adventure trail spring balance beam. Climbing adventure trail swing tyre bridge. Climbing adventure trail steel chain bridge walk. Climbing adventure trail crossed chain walk. Climbing adventure trail steel chain walk bridge. Adventure playground trail twin rubber stepping stones. Adventure playground trail steel fixed safety bar barrier. Adventure playground trail twin in ground talking tubes. Adventure playground trail 20m long ariel zip wire slide.